See how IBM is utilizing blockchain and IoT to create new solutions for logistics and supply chains and see if your IoT use case could benefit from blockchain tech. This is the year that we are seeing business networks based on blockchain put into production around the world. Early adopters are using this technology to reimagine their industries, developing new ways of interaction that reduce friction and foster innovation. There is a multitude of companies working with IBM to implement blockchain solutions for various different use cases. I’d like to share a few that I hope may help you envision how you can use blockchain to advance your business. IBM and AOS, a Colombian company specializing in providing business solutions, are collaborating to create a solution to enhance efficiency in the logistics and transport industry throughout the country, built on IBM Blockchain and Watson IoT. Traditionally, supply chain transactions are completed manually, creating delays and a higher risk for recording error, which can cause differences between what was recorded and what was actually loaded. 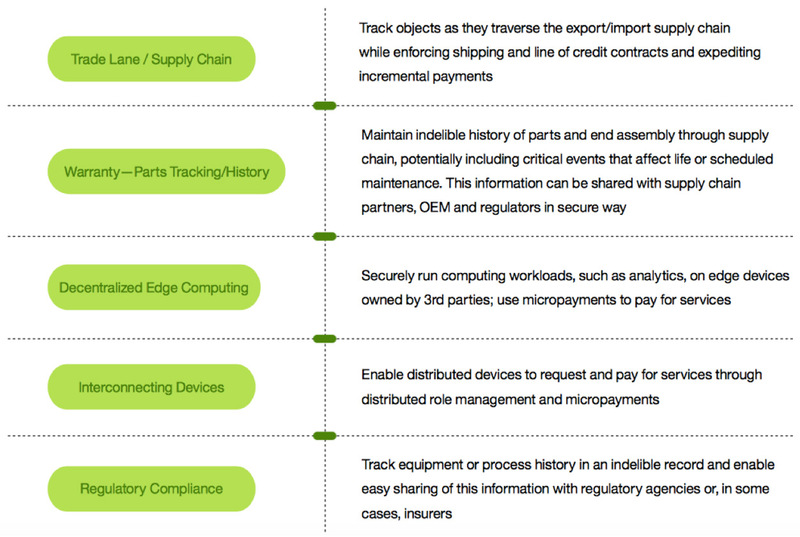 By digitizing this process using blockchain and Watson IoT, the relevant information is captured directly from the sensors placed on the trucks, and entered onto the blockchain, creating a single, shared repository that all authorized participants can access and which can only be altered with consensus from all parties. The new solution integrates Watson IoT to monitor what is happening with the trucks. The solution captures the input and output weight to define available capacity as well as which silo and which person will carry the load; and that data is also correlated to external information, such as weather, humidity, temperature and driver’s data, to estimate delivery time to customers. IBM and Maersk have built the first industry-wide cross-border supply chain solution on blockchain. This global trade digitization solution will benefit the industry using blockchain to manage transactions among networks of shippers, freight forwarders, ocean carriers, ports and customs authorities. The solution enables the real time exchange of original supply chain events and documents through a digital infrastructure, or data pipeline, that connects the participants in a supply chain ecosystem. This promotes sustainable transport by integrating shipping processes and partners, and establishing evaluation frameworks through increased transparency and trusted access. The blockchain solution based on the Hyperledger Fabric and built by IBM and Maersk will be made available to the shipping and logistics industry. The solution will help manage and track the paper trail of tens of millions of shipping containers across the world by digitizing the supply chain process from end-to-end to enhance transparency and the highly secure sharing of information among trading partners. When adopted at scale, the solution has the potential to save the industry billions of dollars. If you’re still asking yourself whether IoT and blockchain are right for you, do you have current scenarios that involve agreements among a group of parties which have a need to share information? Are you trying to track or trade something of value where multiple parties have a vested interest? Here are some examples that are unique to the Internet of Things. As I hope I’ve made clear, we are seeing blockchain used for a myriad of different uses cases to drive better visibility in transaction, supply chain, and to drive more efficient and compliant asset management. To learn more about how IoT and blockchain can enable your business, check out our Watson IoT and blockchain page.